To celebrate the publication of WHEN THE WORLD WAS YOUNG, I posted a nonfiction story called BROOKLYN RULES, about the harsher side of growing up in Brooklyn, on my Twitter feed. 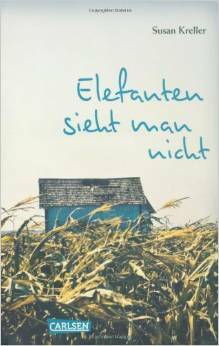 Elefanten sieht man nicht by Susan Kreller. I am translating this wonderful, searing, beautifully written book, with the tentative title of You Can't See the Elephants, for Putnam. Mascha is a lonely teenager who stumbles upon a horrible secret and has the courage to overturn her own peaceful existence in the process of making things right. It won the Deutsche Jugendliteratur Preis, a close equivalent of the Caldecott. David Grand is a master. I loved this book, devoured it. Grand sets such a monumental story in play, beginning with the first sentence, that one might think the pace would be slow, but the geographic timescale of his wonderful character Bloom's life is offset by incredible deftness of storytelling. Just between pages 8 and 25, Grand unspools a backstory large enough to rest a mountain on, and it keeps on going, and getting better, from there. The Brothers Karamazov by Fyodor Dostoevesky. Still reading. The Panopticon Jenni Fagan. This dark and often violent tale of a girl growing up in a home for children is by turns frightening and lushly beautiful, sad and genuinely funny. The Roundhouse Lousise Erdrich. I think my favorite thing about this spellbinding novel was the way Erdrich snuck tiny, illuminating glimpses of the main characterÕs future into a narrative that never actually goes to that future time. Wild by Cheryl Strayed. I loved and came to greatly admire Cheryl Strayed as I read about her hike along the Pacific Crest Trail. Talk about redemption. And great, effortless writing. THE MOTHER WHO STAYED by Laura Furman.                                     I was enthralled by these nine stories and the way their characters, stories and themes overlapped and intersected. A beautiful, masterful collection. WHEN THE WORLD WAS YOUNG is now scheduled for March 2014. I am getting down to work on the next one, which will again be set in New York, this time in the time of subway building, skyscrapers and the Great Influenza. Many of the characters overlap with or are related to the ones in METROPOLIS and WHEN THE WORLD WAS YOUNG, so the three books will end up forming a trilogy, though written out of order. It has a working title of CITYWIDE. THE LIGHT BETWEEN OCEANS by M.L. Stedman. I am usually pretty hard hearted, but I was weeping at the end of this. She takes some risks with point-of-view changes that don’t begin till deep in the book, but it works. WHEN THE WORLD WAS YOUNG. My second novel (under a new title) is finally going into production. It will come out sometime in the first half of 2014. THE INHERITANCE OF LOSS by Kiran Desai. The characters are so full, so flawed, so human, and the language and imagery pitch perfect. AFTER WONDER. This is the new title for my new novel. I am close to being finished with a big revision. Feeling good about that. 1Q84 by Haruki Murakami. I just began this. I love Aomame. War and Peace, Leo Tolstoy, trans. Richard Pevear and Larissa Volokhonsky. I bought my copy of the new translation on Sunday. I am planning to read 100 pages a week with Mary-Beth Hughes, who is teaching it at Pratt. I am going to teach it at The New School in the fall with a pile of other fiction centered on times of war. I should be finished in the spring. I am excited about this. State of Wonder by Anne Patchett. I was attracted to this novel not by any good reason, but by it's title. I was worrying there are too many books with 'wonder' in their titles for me to repeat it in the title of my own new book. I'm not worried about that anymore-it's so very different from my book- and I loved it. I can't stop thinking about the stillborn merbaby and the women gnawing the bark on the trees. It's also the first book I have read on my new Kindle. A great experience, though I do miss page numbers. And I haven't been able to get into The Prague Cemetery in the ebook reader format. Seems Eco demands to be read on paper.